Parenting as a Newcomer: Moms share their stories. 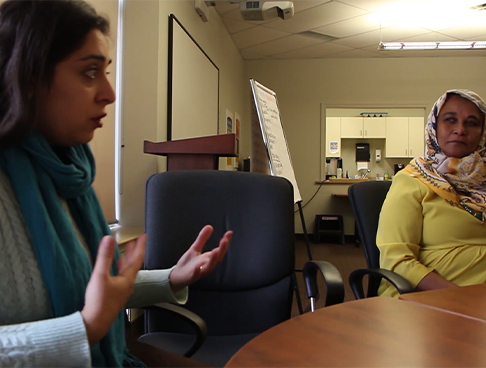 Teresa from Parenting Now speaks with Christen, Omkalthoum, Madonna, Elham, and Wartouhi about parenting as a newcomer to Canada. I was thrilled to be part of a conversation about parenting as a newcomer with Arabic speaking mothers who are now living in Canada. The conversation, shown in the video above, was to share a bit about our stories of learning to parent in a different country than the one we were born in. Each mom expressed how proud she feels about her journey thus far. They felt courageous raising their children away from their original home country and extended family. Each woman is at a different stage of her parenting journey. Some have children already graduated from university and now working. Others have been here in Canada for just a few years. Some have children in elementary school or high school. Some of the moms communicated their children are easy going. Others described their children as more challenging for a variety of reasons, including special needs, and cultural or religious conflict. The women discussed how they themselves were raised in a closed community with restricted rules in their country of origin. They discussed the discrimination they sometimes faced. This could be due to being female, their level of education, and even sometimes because of their religion. Now, being in Canada, their kids are facing a much different and more open culture. It is not easy to fit in sometimes and the immigration handbook does not discuss how to deal with all these new concepts. We heard that raising a child needs a village. However, parenting as a newcomer often means raising their children alone with no help from family or friends. Missing that kind of physical, emotional and financial support is a huge burden. One silver lining is that in some cases, it may be a blessing to raise your own children on your own or with your partner. It allows for their own style of parenting. It can help to create an even more special bond with their children sometimes. The moms communicated that they were very grateful and appreciative of the opportunity to move here to work or study; and to live in a new culture with all its pros and cons. The ability to start a new chapter away from a war zone, extreme poverty or sometimes discrimination in their home country meant a lot to them. One mother expressed her concern regarding the political changes and its effects on education and the school curriculum. She expressed that, in her view, an open minded culture is sometimes an open door for unacceptable behaviours to be the norm. One mother said her son has been diagnosed with autism. She spoke about how the medical and educational system here is so helpful for her child. It makes a significant difference to his progress and social engagement. She said if they were in their home country he would be alone with no activities or special tools to help him learn and communicate. What I found amazing is that all of them agreed that life in Canada is a privilege for them and their kids. They appreciate the right to choose and decide how to raise their children freely but still guided by the modern western lifestyle. Christen is an Experienced Parent for Parenting Now. You can find her online or read a bit about her on our Parent Biographies page. She acted as a translator for this video bit. She and her family came to Canada from Egypt. wow what a great article..As someone who has always lived in Canada I love learning about others experiences. This is really great to learn from. I wish I could have sat in the conversation! So interesting to hear their experiences. Thank you for this insight. It is helpful to create understanding of what our newcomers are experiencing. Thanks for sharing these stories Christen. You have encompassed all the newcomer parenting issues in such a brief but effective write-up. I am glad they had a chance to voice their concerns.